With our extensive 3-D modeling design tools, product selection assistance + pricing process we are able to pinpoint the price and schedule before we dig into your home + disrupt your life. Isn't that dreamy? This wonderful couple wanted to freshen up their fireplace and open up the kitchen to have a better view of the main living areas during family visits. Removing the raised bar + protruding wall, updating sink + faucet, and adding granite + back splash gave the needed lift the homeowners were desiring. Modernizing the fireplace facade with 3" thick walnut post and lintel style surround with modern 12x24 tiles completed the look of the new space. From ordinary to Extraordinary with Color! Our homeowners are a right brain/left brain couple, but this was her baby. Mili fiore tiles from Italy, bold limes, greens, oranges, pinks + purples, topped with art glass pendants. We took an awkward bottle neck kitchen layout and expanded it into the sunniest area of the home. We relocated the drop area to the garage so we could move the entrance door. Adding fresh white cabinets with interior color to showcase her wonderfully playful collections of service wear + cook books. New appliances for the incredible chef that she is surrounded by soap stone counters. There is even a dog bowl nook. Now the family enjoys cooking + entertaining with zest! Moving from golden oak to sleek + sophisticated took a little ingenuity. This dated open, but partitioned floor plan went through some big changes. We removed a dated wall divider, updated the fireplace facade on bath sides, installed a wood encased glass railing and totally redesigned the kitchen layout. Removing the raised bar wall opened the kitchen to be accessible from two points of entry. We hid the refrigerator, relocated the sink to the window and created additional pantry and baking spaces. The window seat was part of the design, but they opted to add that at a later stage. Solid surface counters, new hardware and lighting all added to the modern updates. Golden Oak abounds in many of the homes we remodel. 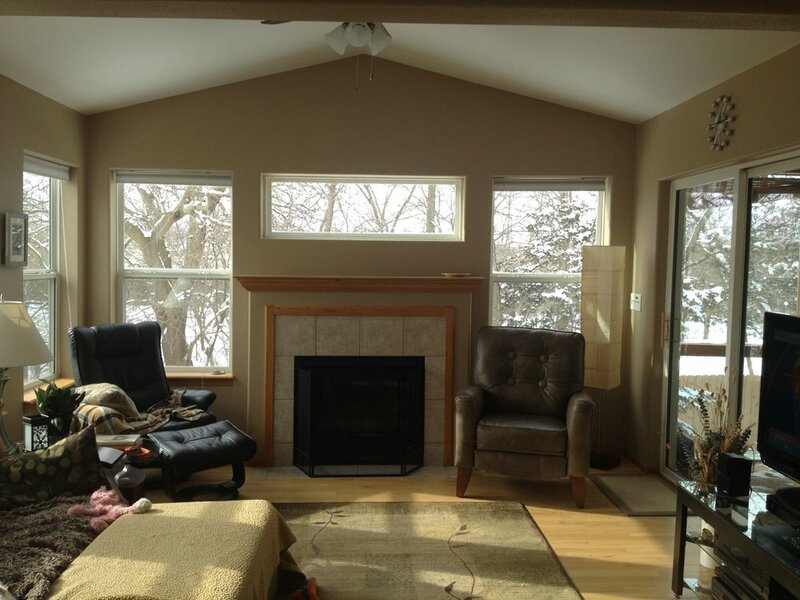 Some owners embrace it to create new layouts like this remodel. We opened the kitchen to create an angled raised bar wall. Our homeowner was super recycle friendly, so we re-purposed many of her cabinets and added a few new ones to enhance storage and functionality. The fireplace facade was tired and had a precarious location so we refurbished with a cottage chic crackle finish and created a reading spot. Beach colored oak flooring, solid surface counters and tumbled marble back splash all compliment the cottage feel she loves. Soothing green walls, cozy carpet for the living area and a little furniture relocation and its time to enjoy.